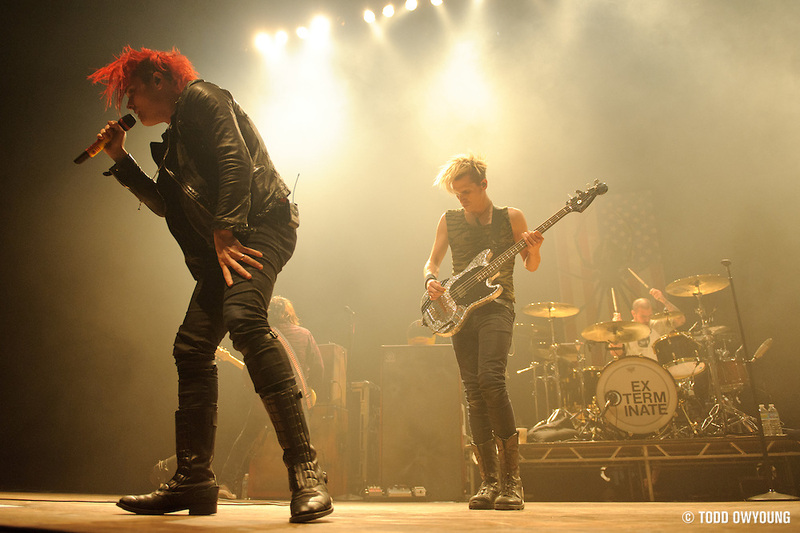 I never had the opportunity to photograph My Chemical Romance in the glory days of the hugely theatric Black Parade days, when the band was rocking out with spotlights, costumes, and all that glorious high production. But photographers: Never fear. The band is still a blast to shoot. But you better come prepared, or they will destroy you. 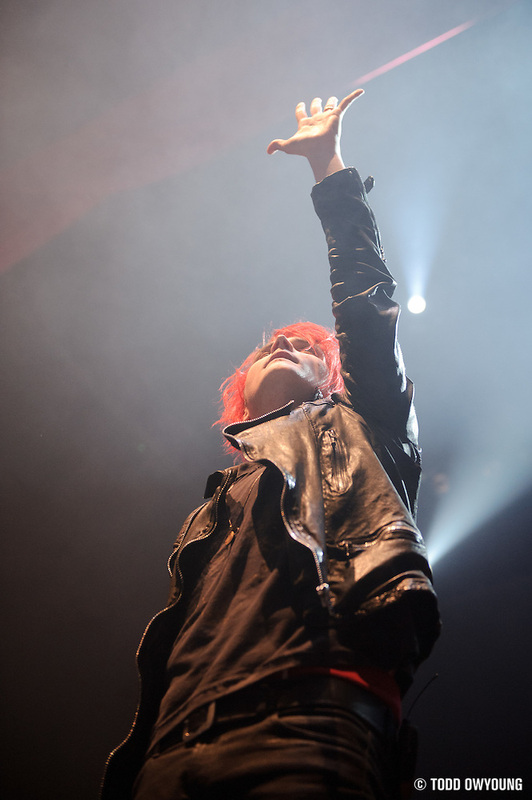 I'm convinced that My Chemical Romance is just one of those bands that loves crazy, spazzy lighting. 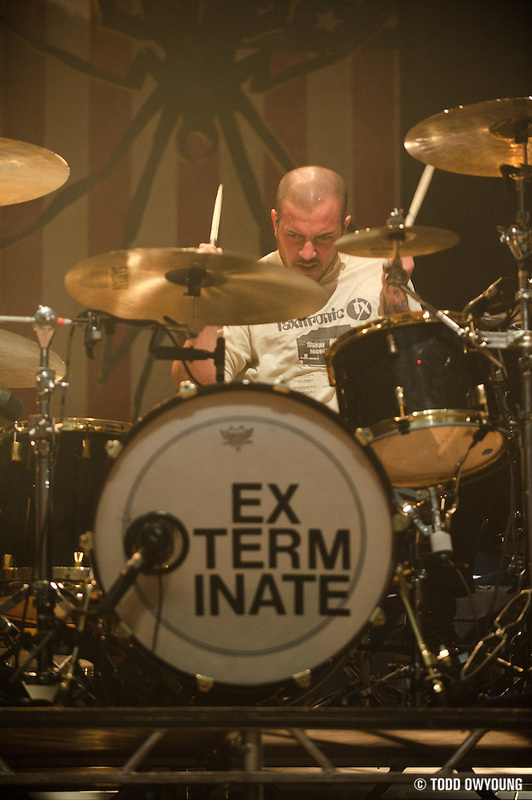 Sort of like Dillinger Escape Plan or Underoath, just less extreme. But don't think I'm complaining – the band has such a tight live performance that it's still a thrill to photograph them. You just have to bring your A-game. 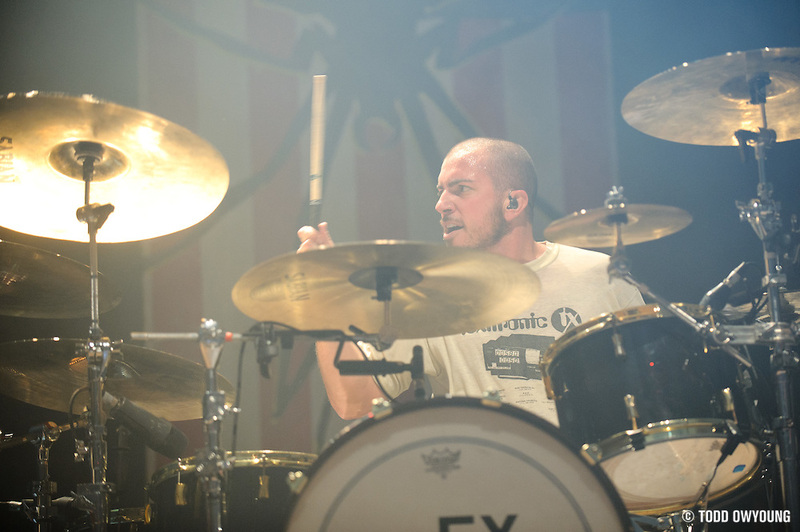 Overall, the band's high-energy energy performance was both a blessing and a curse – tons of movement, dim-ish lighting, and general chaos in the pit all combined for a tough job. On the flipside, this same fantastic intensity made for lots of photo opportunities – if one was fast enough to catch them. The Nikon 24-70mm f/2.8 was easily the champion of this show, and handled most of the heavy duties on the Nikon D3. 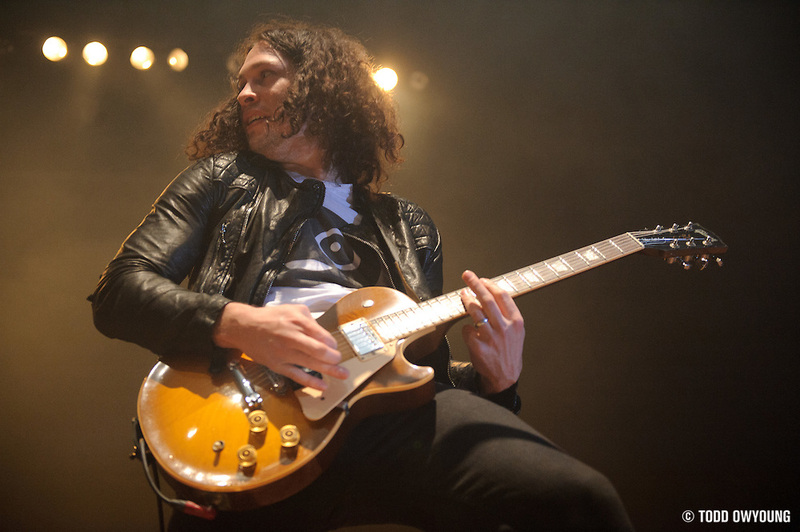 The Nikon 70-200mm f/2.8 was useful for a few longer shots, but legendary as the midrange for usefulness at this MCR show. 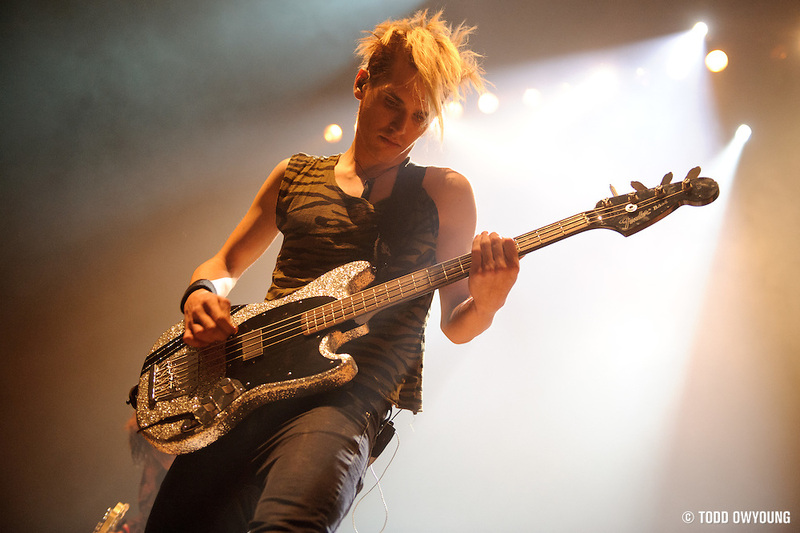 Mikey Way is probably the easiest subject of the band – he moves around enough to make things interesting, but not enough that tracking was ever an issue (like it was for his bro Gerard). 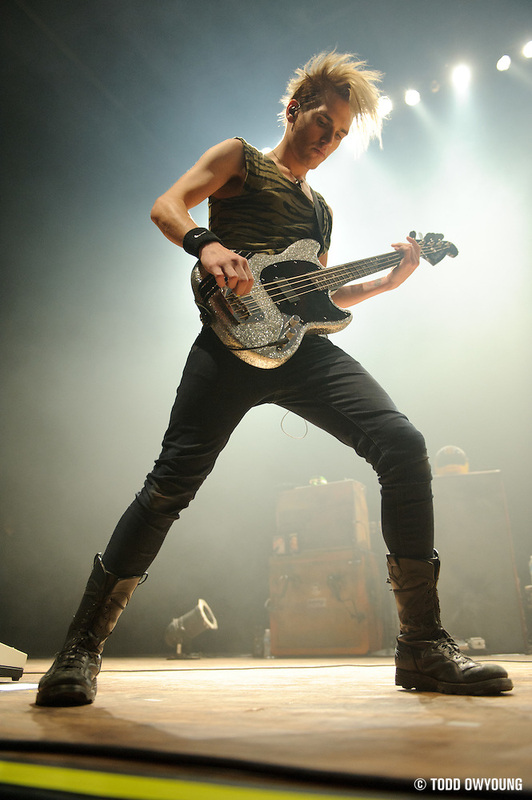 Also, Mikey rocks the power stance pretty much all the time, so be wins bonus points there, too. 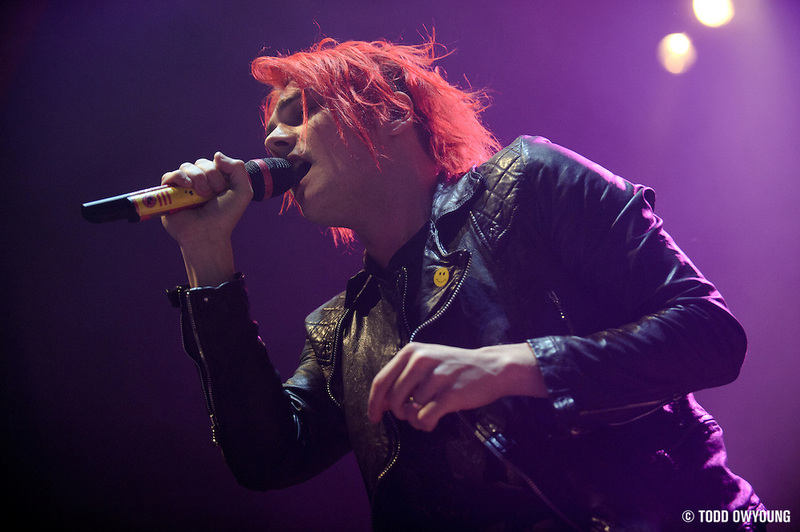 Gerard is a close second because of the bright hair, though. 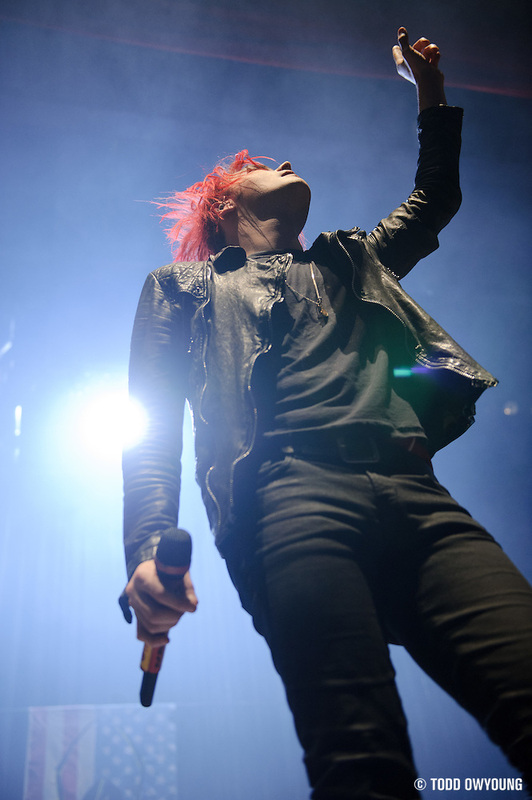 Lighting was much better than MCR's previous tour, which was humbling to say the least, but still consisted of lots of quick backlighting that flared up and lit up the haze beautifully. Since most of the lighting comes from the house rig, the details of the front and back lighting will be up to your venue. At the Pageant, the front lights are so high up that they weren't great for catching Gerard at the front of the stage, but your gig may be different. 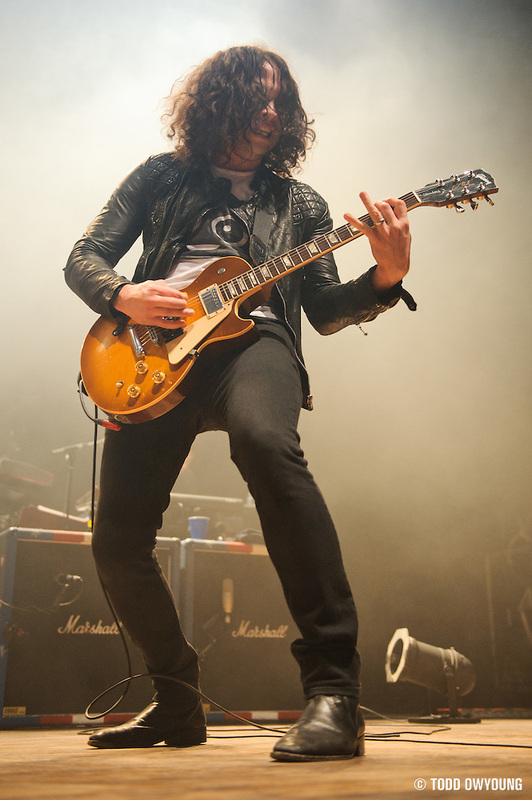 @toddowyoung Great work, pumped to shoot MCR in a arena in Feb.
@shoottothrill Thanks for the kind words. I’m envious you’re getting to shoot them in an arena, sounds like the lighting will be glorious. @toddowyoung Shot them in a small(ish) room this year and found it pretty tricky! @toddowyoung I would love to exchange tips and tools about romance, intimacy and happy, passionate relationships. Just shot them last week! 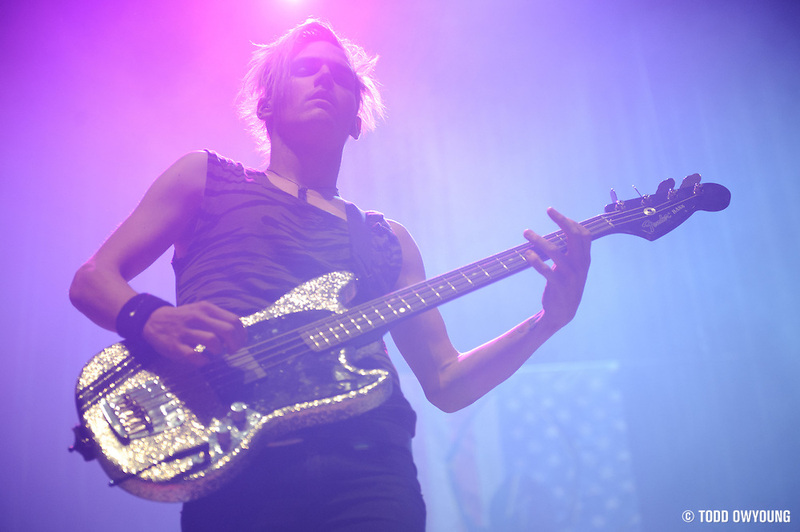 Mikey Way might be the most photogenic musician I’ve shot yet. I was asking myself how I could form an Uma/Tarantino, Leo/Scorsese muse-type relationship with him LOL But really their current look really lends itself to the camera. Thanks for the comment. Mikey is a photogenic performer, definitely. This tour was much easier than shooting their last go around, but still pretty tricky for lighting at the Pageant. I’m envious of the cleaner lighting that it looks you had! Nice job. 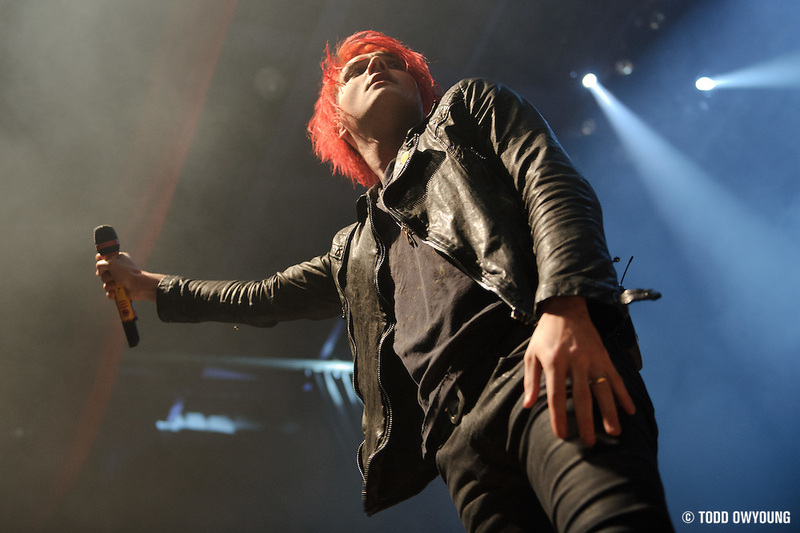 These are amazing, I love the way you captured Gerard’s energy on stage! I hope I’ll get the chance to shoot them when they’re over in the UK next spring! I visit your site quite often. I think your work is great and professional looking. I also think you pass yourself off as professional. Do you think it was a professional decision? Do you think it is fair to all of the other music photographers out there (who are trying to make a living at what they do) for you to just give your work away for the opportunity to take a few pictures? The images you display here are not even yours. Sure, you took them but… they really belong to the band. I’m the house photographer for a venue myself, and I get paid for what I do. But… I walk from rights grabbing contracts and the venue fully supports my decision. You should be walking too, your work is too good to be giving it away. You assume too much, Larry. But we’re in agreement – I wouldn’t want to sign a contract like that. but you really signed the photo agreement (http://www.facebook.com/album.php?aid=36188&id=158471797503461#!/photo.php?fbid=183570104993630&set=a.158488740835100.36188.158471797503461&pid=725945&id=158471797503461)?? If I would have had to give up my copyright or agreed to any of that contract, I wouldn’t be posting these images (or have shot). Could you please share with us how you got around signing the contact that was presented to every other photographer? In a couple of weeks they will play in a venue next to me and I really want to shoot them but not if I had to sign!! 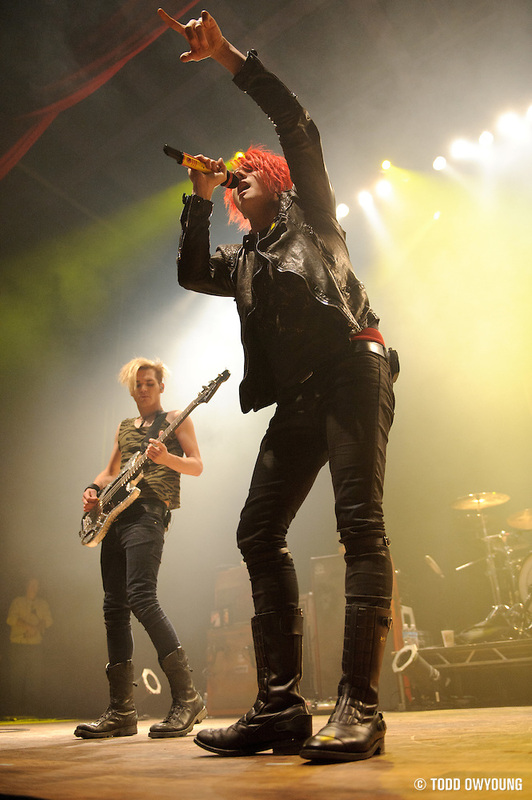 Well I like MCR and I’ve never seen them live, dunno when they will come to my country but I do love watching pics of them and these were pretty god, really. no pictures of frank? why’s that? anyway, these are really great. good job. hi Todd,i love your work. i refer your site to lots of people here in the UK. addeded contrast, darkened the hightlights then reduced the colour a bit and imho it has more bite. Thanks for the honest feedback. I personally prefer the brighter highlights (they’re not even blown, but even then I love a nice feathered highlight). Your edit is a little more dramatic, but it’s a little too muddy for my taste on my monitor. I do a batch export, but I develop the images individual in Lightroom. Thanks again, and thanks for the support, I appreciate it. nice one Todd,we all see it different. you should come over to England one day and take some shots here. we have some great summer fstivals i am sure you would like. ps i like your gear revues they are a help.